Surfers and surf watchers energize this area! During winter storms, water from the restless ocean slams with a thundering roar into a hollow rock formation shaped like a huge punch bowl. The surf churns, foams, and swirls as it mixes a violent brew. 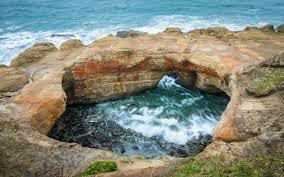 The punch bowl was probably created by the collapse of the roof over two sea caves, then shaped by wave action. The park is a popular whale watching site and displays an intriguing geology. This is a scenic picnic spot atop the undulating rocky shoreline. Don't forget to explore the tide pools on the north side of the punch bowl!